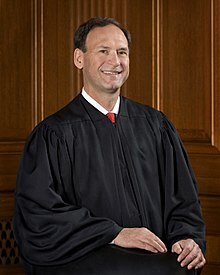 Samuel Anthony Alito, Jr. (/əˈliːtoʊ/; born April 1, 1950) is an Associate Justice of the Supreme Court of the United States. He was nominated by President George W. Bush and has served on the court since January 31, 2006. Alito was born to Italian American parents. He served in the U.S. Army reserves from 1972-1980, as Assistant United States Attorney for the District of New Jersey 1977-1981, as Assistant to U.S. Solicitor General 1981-1985, as Deputy Assistant Attorney General, 1987-1990, and from 1990 on as a member the United States Court of Appeals for the Third Circuit before his 2006 nomination to the Supreme Court. Alito holds an originalist view of the law. The vote by the U.S. Senate to confirm Alito to the Supreme Court judge was the second narrowest in recent U.S. History to that point (58-42), the only narrower one being the 52-48 vote to confirm Clarence Thomas. Alito is from Trenton, New Jersey. ↑ Babington, Charles (February 1, 2006). "Alito Is Sworn In On High Court: Senators Confirm Conservative Judge Largely on Party Lines". The Washington Post. This page was last changed on 11 December 2018, at 13:10.